I would like to take the opportunity to thank everyone who visits my blogs and takes the time to leave me such sweet comments. It's been almost a year since I started this blog. I originally started it as a way to keep in touch with my daughter and who was off in college in FL. Most of you know that my daughter was killed in a car accident. It's been 6 months since the accident and I miss her so much every second of everyday. I think the one thing that has kept me going is my love of this hobby as well as all of the support that I've gotten from so many people who belong to this wonderful group. Cindy's 24th birthday is April 6th. So in her honor and as a way to say thank you I've decided to get some candy together for you. Please leave a comment below as well as your blog address if you have one. I have no idea how to do Mr. Linky so I will put all the names in a jar and have my husband pull the winning name.I would love it if you chose to follow my blog and post this candy on your sidebar but it isn't necessary to win. Thank you again for all the love and support that I've gotten from this group. You have no idea how much you've touched my heart. http://thehoosierstamperleahanngast.blogspot.com I really don't want to put my email address but if you go to my blog and leave a comment, I will get it. Every time I visit your blog I am just so inspired by your beautiful works and your beautiful spirit. Thank you for this chance. 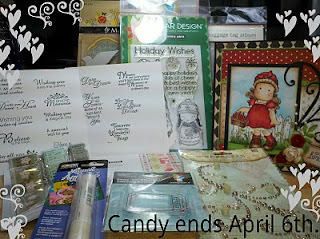 Thanks for the chance to win your blog candy, Julie. I am heading to my blog to post it there as well. What a beautiful girl. I am so sorry. Thank you for celebrating her with us. Your blog is amazing. Your creativity has inspired me. Thank you for honoring your beautiful daughter with us and allowing us a chance for us to win blog candy. My thoughts and prayers are with you. Sorry to hear about your daughter. What a wonderful way to honor her. I am so sorry for the loss of your daughter, I am a mother of two boys and I cant even imagine the hurt that you are feeling, wow you are amazing person to be on this journey with out your daughter and keeping her memory alive,my thoughts and prayers are with you and your family. Thanks for the chance to win your thank you candy. Oh my so sorry about your daughter !!! Oh Julie, I am so sorry. What a huge hole is left in your heart. I will certainly add you to my prayers. What a thoughtful thing to do with the blog candy. Thanks so much. And before I go I have to tell you that I looked around here and you do amazing work! Your title "born to stamp" is certainly correct. So sorry to hear about the loss of your daughter. And wonderful blog candy as your daughter was a wonderful person. Hi Julie, I'm so sorry about your daughter. Just found your site and love it! Just became a follower. Thanks for a chance to win some candy. It is really hard to loose a loved one. So sorry for your loss. I also love your cards and am very glad this group helps you. I too use this group as a help to get through alot and love making cards and seeing all the beautiful ones everyone else makes. Your daughter is beautiful and I am so very sorry this has happened. You know Julie, you have many people holding you in their hearts and loving you through all the days. What a wonderful idea - to celebrate your daughter's birthday with all of us. Julie, I wasn't aware of your loss either. I can't imagine losing a child and still have a desire to craft as beautifully as you do. You're an incredibly strong person. It's nice to know that our Maggie group has help to support you and your family. I am sorry for your loss,my thoughts and prayers are with you!It is not a easy thing,I hope your nights get shorter as time goes by.Remember your heart will always be full with your love for her and I am sure that she knows it even now when you are thinking about her. Julie, I think you are doing an amazing job of coping with the worst tragedy that can befall any parent. Know that you are in our thoughts and prayers. You honor her with your creations. Thankyou julie for sharing your daughter and your blog with us. thats such a beautiful photo. So sorry about your loss. What a wonderful thought to celebrate her Birthday with blog candy. I don't know how you find the strength to deal with this Sweetie - just looking at Cindy's beautiful face and realizing the chasm her passing has left in your family is more than the soul can bear. Love and light to you and yours on this anniversary of her birth - my own sweet girl was born on April 3rd - I will be thinking of you then and saying a prayer for you for a peaceful heart. One should never have to bury a child. You are too sweet to offer blog candy in your daughter's name. May God give you peace. Your daughter was so lovely. What a beautiful way to honor her life by sharing with others. I'm so very sorry for your loss. I cannot even imagine what that would be like. Prayers coming your way as her birthday approaches. Wat een mooi idee, om je dochter te gedenken door middel van deze candy. Ik wens je veel sterkte, licht en liefde toe. Hi Julie! This is the first time I've visited with you :) I am so very sorry to hear about losing your daughter! I do agree about having our crafts and blogging to keep our minds especially busy during times of extreme difficulty. It has 'saved' me many many days! May the LORD bless you, keep you and comfort your soul, dear friend ♥ He IS our Healer! Julie, I am so sorry about your loss of your beautiful daughter. I can't even imagine what you have gone thru. I'm sure your faith has given you the stregnth and comfort to ease your pain. Thanks for sharing your story with us and for the chance to win some candy in her name. Julie, I am so sorry about your daughter. What a beautiful young lady. I have a son who is 24. I cannot imagine what you have gone through. My prayers are with you. May God keep you and comfort you! Bless your heart Julie. I know the pain of losing a child so all my prayers are with you. Your blog is great hun!! Your cards are just lovely!! Thanks for the yummy candy! It's very sweet that you're offering it on Cindy's birthday! Take care! I am so sorry about your loss. She was a beautiful girl! Sorry for your loss, she looked like such a beautiful and kind young lady. Its very sweet of you to do this candy in her honour. Thank you for the chance. What a beautiful way to honor your daughter's memory. You can tell from her smile that she was beautiful inside and out. Thank you for the chance to win candy. I'm still working on my blog so it isn't up yet. Julie, I'm so sorry to hear about the loss of your daughter. It's so sweet of you to do this candy in her honour. Thanks for the chance to win. Oh Julie, I am so sorry about your beautiful daughter. I just can't imagine the hole that is left in your heart. I pray that God wraps His arms around you and your family and gives you an extra measure of peace and love, especially on her birthday. You are so sweet to remember her with such a generous gift to your cyber friends.